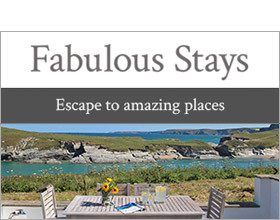 Lying only a short drive from the azure seas and clean white sand beaches of Hayle, Gwithian, Carbis Bay and St Ives, Angarrack Farmhouse Cottages are the perfect choice for families, couples or groups of friends seeking a holiday close to one of the most scenic stretches of coastline in Cornwall. A sleepy backwater well located to explore, they nestle on the edge of this unspoilt village with a range of activities within easy reach. Watersports, challenging golf courses, gokarting, birdwatching and a host of attractions including famous art galleries, legendary Island Castles, gardens and wild life parks are all but a short drive away. Sample good Cornish fare at the local Inn or venture out to one of the many fine restaurants tucked away amongst the bustling cobbled streets of St Ives. The Christmas lights of Angarrack are a very special attraction and after a walk around the village you can return to the warmth of an open fire. Angarrack Farmhouse is an attractive white rendered farmhouse with its own large sheltered garden. Guests will enjoy idling time away relaxing in the invigorating waters of a hot tub or having a leisurely family barbecue or picnic on a superb elevated deck. Step inside and you will find a wealth of traditional character. Furnished with a stylish leather suite the lounge retains an open fire for cosy evenings; pine furnishings and glazed cabinets full of china and nic-nacs add rustic charm to the dining room, while the adjacent kitchen is well equipped for ease of catering. As with many old cottages the newly refurbished family bathroom is located on the ground floor and upstairs there is a smart new shower room and four comfortable bedrooms. Stairs lead down to a cellar laundry room (beware low beam) with convenient access to the garden. There is allocated private parking for two cars. Over two floors. Four bedrooms: 1 x king, 1 x double, 1 x single, 1 x twin. First floor shower room with basin and WC, ground floor family bathroom with bath, shower cubicle, basin and WC. Kitchen. Utility room in cellar. Dining room. Sitting room. Low beam in cellar. Hot tub available between March and November only. Note: £100 Good Housing keeping Bond.